Taste test: It's always exciting when they come out with a new Doritos flavor, so I was looking forward to trying these. The first thing I noticed when I opened the bag was how big the chips are. They're quite a bit bigger than the regular Doritos, plus they have rounded corners. 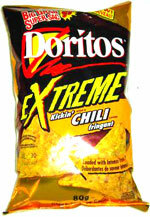 They have a chili-like taste, and it's not bad at all, but the flavor is not very "extreme." It's not that tasty, and it's not that hot. There's a mildly hot aftertaste. 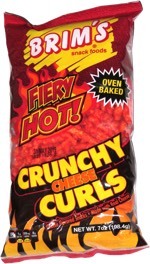 I've had better chili chips, especially in England. Smell test: Smells like taco powder.